Professional bagpiper available for weddings, funerals, and parties for all occasions. Jimmy did an outstanding job providing music for son’s military funeral. Thank you Jimmy for an excellent job in honoring our son. Jimmy was awesome. Great to hang out with at our Burns Night Supper. Super flexible and all around fun and talented! He was on time and played beautifully! Really amazing! If you like bagpipes, look no further! 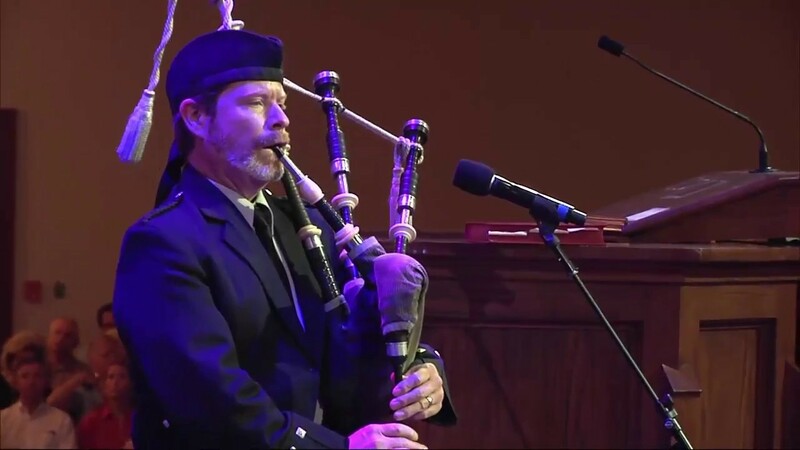 Our church invited Jimmy to play at a recent service while our pastor was in Scotland on sabbatical. We definitely felt a Scottish connection with the pastor that Sunday! Jimmy is professional, talented, and a pleasure to work with. He stayed after the service and spoke with many of the members in our congregation, who graciously thanked him for the songs he played. Jimmy will be in Scotland in August, 2018 to compete at the World Pipe Band Championships for the 11th time (he's also dedicated to his craft!). Jimmy was magnificent-highly recommend him for any event. Beautiful music, well played and heart moving. Jimmy arrived on time and performed just as requested. He has great talent, and everyone enjoyed his performance. Jimmy was very professional he sounded great and he was willing to do whatever is necessary to make our wedding very special . I would recommend him for anyone's special event. Jimmy Mitchell is an extraordinary musician as well as a charming individual. It was a great experience to have him play for our friends and family. I no doubt will book him again. Thank you Mr. Mitchell! Mr Mitchell did such a wonderful job playing the bagpipes at our wedding ceremony he truly added a unique touch and made it one of a kind! he's not only very professional but a wonderful person to work with. I thank you so much for the amazing job you did at my wedding and we would highly recommend you to anyone who want something special in their wedding! We were married day before yesterday. 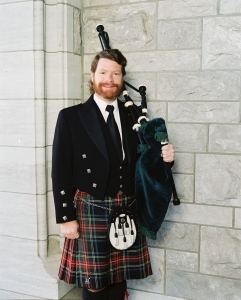 Our parents wanted to get us a bagpiper for our wedding as a gift. They had originally found another musician... that wanted twice as much money, a million dollar insurance policy, and other unbelievable demands. I went looking, and thank GOD I found Jimmy. He was incredibly courteous and professional from the word go. He knew one of the songs we wanted, but had to learn the other. He had no problem doing so, and performed flawlessly. He showed up to our outdoor venue an hour early and began warming up his pipes. I cannot stress enough how much of a blessing it was to find him. He was everything we were looking for and so much more. If you need a piper... HIRE JIMMY! You will not be disappointed! I hired Jimmy Mitchell to play for two events. Mr. Mitchell displayed great professionalism in both his communications and his playing. Additionally, he was prompt and dressed impeccably. I truly could not recommend Mr. Mitchell any more highly. My piping journey began in 1981 as a 4th Grader at St. Thomas' Episcopal School in Houston, Texas. About the third week of school one of the seniors came to our classroom and asked who might be interested in joining the pipe band and learning the bagpipe. A couple of my friends raised their hand so I did as wellÃƒÂ¢Ã¢â€šÂ¬Ã‚Â¦peer pressure at work. 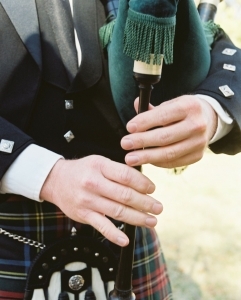 While the senior was adding my name to the list I remember asking him, "By the way, what is a bagpipe?" So this is how my piping journey began. By 1985, under the expert leadership of Mike Cusack, we had progressed to the level where we were ready to compete at the World Pipe Band Championships in Scotland, where St. Thomas' placed 1st in the Juvenile Division. This marked the first time an American band had ever won a World Pipe Band Championship. During our month in Scotland the band toured the country competing at various Highland Games. It was during this time I learned more about the origin of the bagpipes and gained much of my knowledge of Scottish culture. I came away from this trip with an even stronger desire to become the best player I could be. During college I joined the Hamilton Pipe Band, playing once again with many former St. Thomas' classmates. 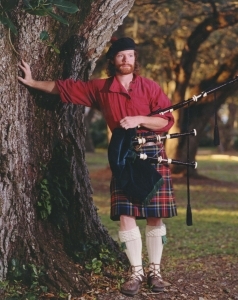 Our Pipe Major, Donald MacPhee, focused heavily on competition and almost overnight turned us from a street band to Grade III champions at the 1990 Stone Mountain Highland Games in Atlanta, Georgia. In addition to this accomplishment, I competed solo and won the Grade I trophy and Amateur Piper of the Day. In 1991 the band returned to Stone Mountain and again won first place in Grade III. With continuing success we would go on to win the Grade III and Grade II United States Championships in Alma, Michigan, where I would once again win solo awards. In 1993 the Hamilton Pipe Band traveled to Scotland to compete in the World Pipe Band Championships where we won best overseas band in Grade II. Upon our return to the states, the band would also finish first in the Celtic Classic competition in Bethlehem, Pennsylvania, and first at the Santa Rosa Highland Games in California. After college, my focus shifted from strictly competition to include entertainment where I would help build what would become a very successful Celtic group, The Rogues. It was at this time I knew piping was what I wanted to do full-time. For the next four years I would divide my time competing with the Hamilton Pipe Band and playing with The Rogues. In August of 1997 the Hamilton Pipe Band, now headed by Doug Frobese, once again traveled to Scotland where we won the Grade IIIA World Pipe Band Championship. We returned again in 1998 to place 3rd in the Grade II World Championships. After this accomplishment I decided to leave the Hamilton Pipe Band, and competition, to focus on playing with The Rogues full-time. During my years with The Rogues we made five albums, toured throughout the United States, and performed in Canada and Scotland. At this time I also started teaching the bagpipes and several of my students have won trophies and awards in competition. This is also when I started composing tunes, several of which are on The Rogues' albums. My first composition, "The Rock," was even played by a pipe band at the World Pipe Band Championships. At the end of 2004, after nine years, I left The Rogues to begin my solo career where today I find myself very busy with weddings, funerals, church services, golf tournaments, cultural events, anniversary and retirement parties, just to name a few. As always, I continue to look forward to what the future holds in my piping journey! Dear Mr. Mitchell, Thank you so much for adding so much to our wedding. We love your music and our heritage and will hope to call on you again, as well as recommend you to our friends. Blessings on you. Thanks again for everything. We loved you there to pipe us out of the church! It was just perfect! My family absolutely LOVED it! The pleasure was ours! Derek loved the surprise and our guests were thrilled. I'll be sending any other brides looking for a bagpiper your way! We were delighted with your playing on New Year's Eve - it really made our party! Thanks again. All the best for 2007. Thank you for the wonderful Christmas surprise. It was so thoughtful and sweet. There is just no way to tell you how much I enjoyed it or how much it meant to me. You play so beautifully! I just wanted to thank you for helping to create a beautiful wedding ceremony and reception. I loved the music and everyone else did too, you did a wonderful job! Thank you again so much, and please know that we will be contacting you in the future for our other family events! Justin and I thank you so much for your fine playing at our wedding ceremony and reception. Everyone we talked to was taken aback by the majesty of the pipes, and we both feel that your playing and presence at our celebration made our wedding perfect! !